There are many techniques you can use to break down a puppet. In this section, you will learn about one of the most common and simplest methods. For your first character breakdown, follow these instructions to get an idea of the way Harmony works. Once you understand Harmony's basic functions and commands, you will be able to create your own techniques to satisfy the needs of your production. 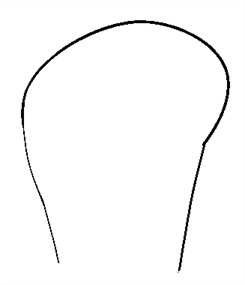 The main breakdown technique shown here is to trace your model—see the Appendix to learn about more techniques. In the Timeline view, add a new drawing layer for each body part to separate. You can press Ctrl + R (Windows/Linux) or ⌘ + R (Mac OS X)—see Naming Conventions. In the Timeline view, select the layer's first cell in which you want to draw the part. In the Tools toolbar, select a drawing tool. In the Colour view, select a colour swatch. If you haven't created a palette for your character yet, see Colour Styling. In the Camera or Drawing view, draw the new part with as with as few points as possible so the pieces are easy to manipulation, modify or redraw. 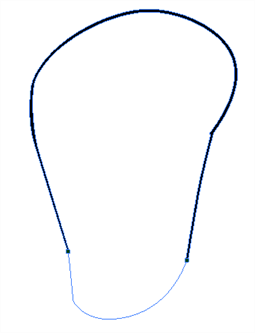 Using the Polyline tool would make it easy to do this. If you are working in the Drawing view, click the Light Table button in the Drawing View toolbar to display the other layers as washed out colours. 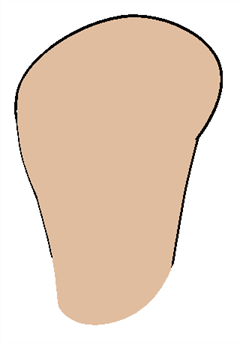 You can also press Shift + L.
You can use the Stroke tool in the Tools toolbar to create an invisible hairline if you want to close a shape without drawing an actual stroke. ‣ Select View > Show > Show Strokes or press K to display the invisible lines. In the Tools toolbar, select the Paint or Paint Unpainted tool to colour your drawing. In the Colour view, select the corresponding colour. In the Camera or Drawing view, paint your drawing. In the Tools toolbar, select the Select tool. Select your drawing and flatten the lines by clicking the Flatten button in the Tool Properties view. If your lines are composed of several pencil strokes, you might want to combine them into one single smooth pencil line. Using the Select tool, select the pencil lines to be merged and in the Tool Properties view, click the Merge Pencil Lines button. Repeat the entire process until the break down is completed. 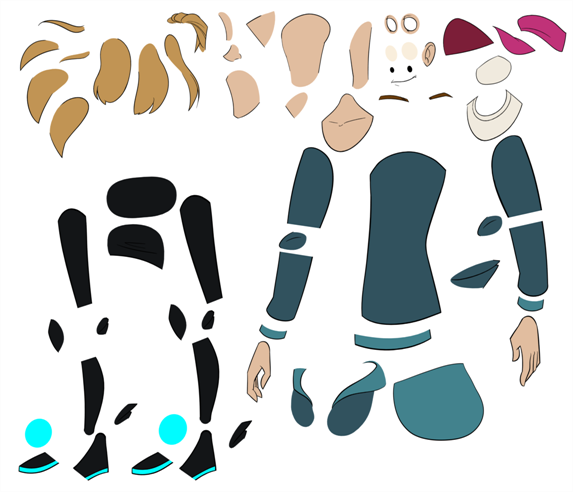 It is recommended to add parent pegs to your drawing layers which are path layers that let you add keyframes to modify the positions of pieces over time. It is not mandatory, but it is helpful to have your drawings and keyframes separated—see Disabling the Animation on Drawing Layers. In the Timeline view, select all the layers. In the Timeline Layer toolbar, click the Add Parent Peg button to add a parent peg to all selected layers. Harmony lets you extend your rigging techniques beyond normal boundaries and sets new standards. You can create hierarchies without encapsulating pieces inside each other by creating a linked structure between layers. 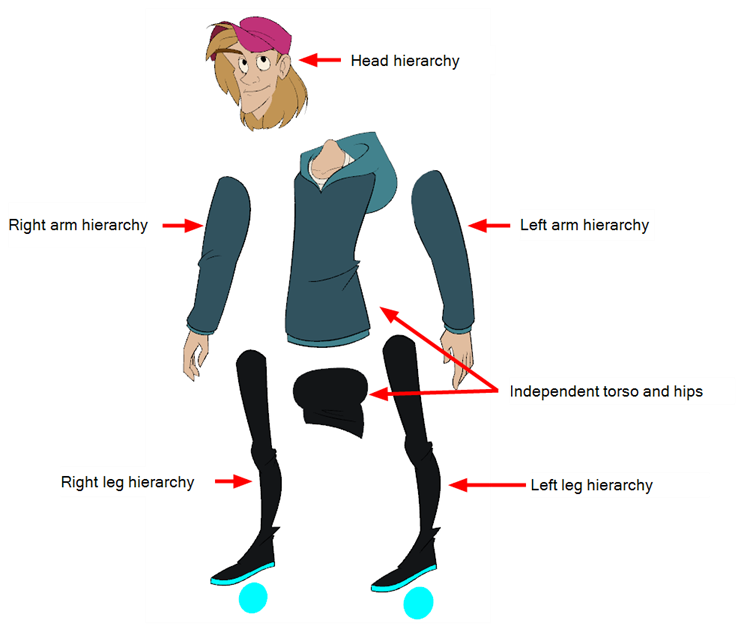 You should create a hierarchy on the arms and legs, and keep them separated from the body. This gives you more animation freedom, and when you need to scale or skew the torso, it will not affect the entire body. Drag the child piece (hand) and drop it ON the parent piece (forearm). Then, you can drag the parent (forearm) piece onto another parent piece (upper arm)—see Nudging Parts Backwards and Forwards to reorder parts that should be in front of their parents. ‣ You can unparent layers by holding down Shift and dragging the selected parents away from the child layer. 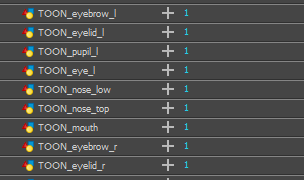 Drop your selected between other layers. 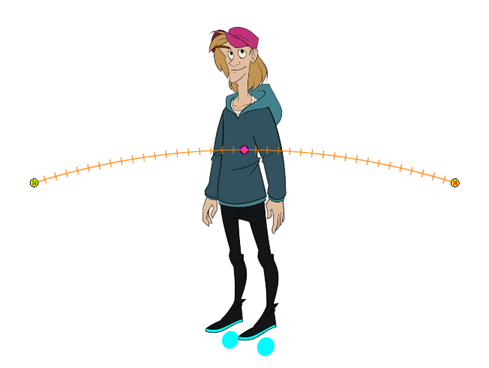 When you animate your character, you will probably need to resize and reposition it to fit your scene. When you need to scale down or move your character, it is a good idea to hook (attach) the whole puppet to a trajectory. Attaching your puppet to a peg will allow you to scale it and reposition it without having to do this to the different parts and pieces. 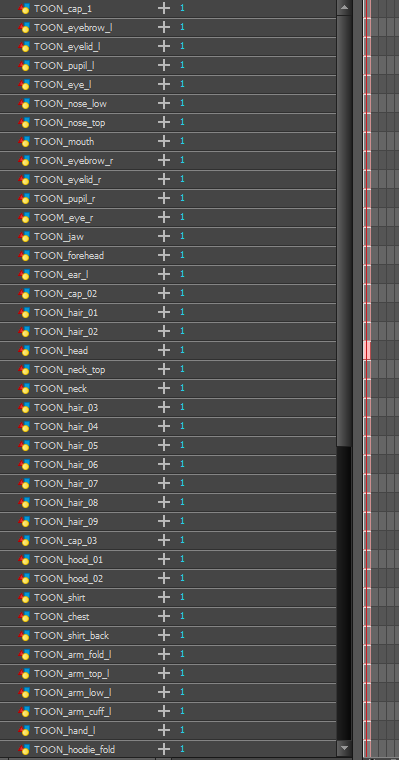 Only one layer will contain the position information, which makes your animation easier to modify and control. In the Timeline view, select the top layer to parent a peg to it. 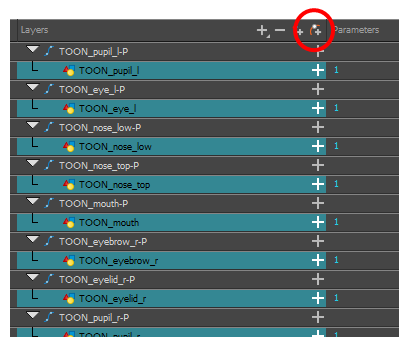 You need to select a layer to be able to add a peg to your scene. In the Timeline view, click on the Add Peg button. A new peg is added to the timeline as a parent of the selected layer. Name the new peg Master plus the character's name. In the Timeline view, select all the layers you want to attach to your new peg. Remember that one item is already parented to that peg. 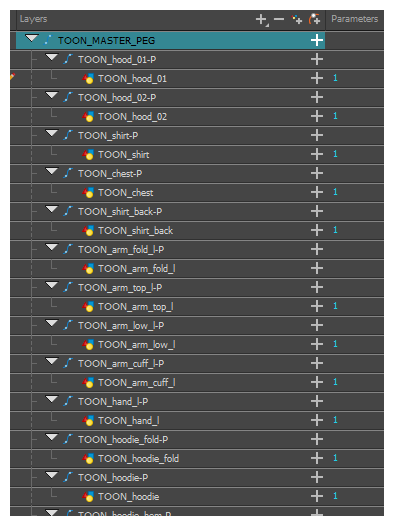 Drag your selection ON to the peg layer to parent all your character's pieces to the peg. 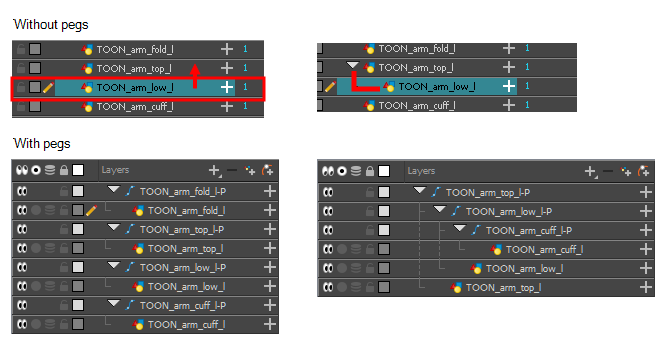 If your layers are added above the already parented layers, move that parented layer back on top of the layer stack.